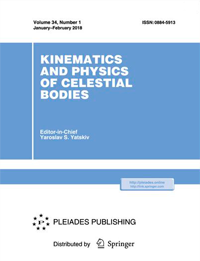 The main astronomical observatory of the NAS of Ukraine publishes the journal "Kinematika i fizika nebesnykh tel" ("Kinematics and physics of celestial bodies") since 1985 (ISSN 0233-7665). The journal includes original and overview articles on theoretical astronomy, the theory of the Earth's rotation and cosmic geodynamics, dynamics and physics of the bodies of the solar system, solar physics, star physics and interstellar medium, the structure and dynamics of the Galaxy, extragalactic astronomy, atmospheric optics and astroclimate, studies of instruments and instruments, mathematical processing of astronomical information. Among the authors of the journal are scientists of astronomical observatories and institutes of both Ukraine and many foreign countries. Journal Languages: Ukrainian, Russian, English. Issued: 6 times per year.